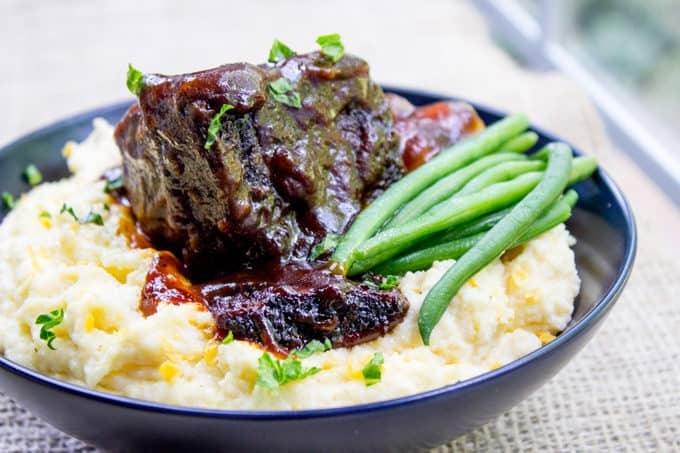 Easy Braised Short Ribs with bbq sauce are crazy tender oven braised short ribs with just 15 minutes of prep. 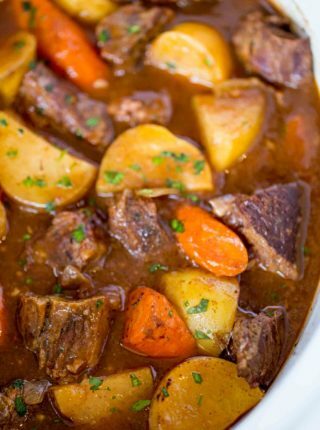 We love easy braised beef recipes including my delicious recipe for Pot Roast, Ultimate Beef Stew and my favorite Vegetable Beef Soup that makes you feel like you’ve stepped off a plane and into Paris. 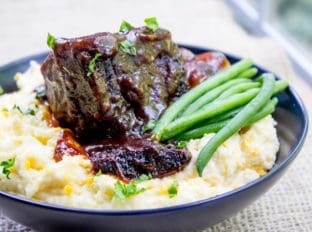 Easy Braised Short Ribs are my go to “hey this looks super impressive” comfort food dinner when I’m looking for a shortcut but still need an amazing presentation. 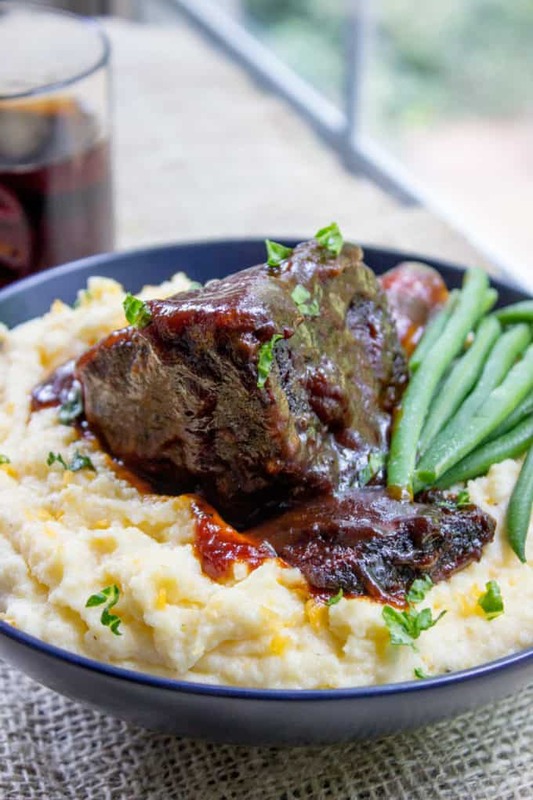 Instead of creating the braising sauce from scratch, I use my favorite BBQ sauce recipe and a small amount of beef broth with just a few vegetables for the easiest, most delicious meltingly fork tender short ribs you’ll ever eat. The trick behind the perfect braising is the searing of the beef before it goes into the oven. First you’re going to season the ribs with salt and pepper and toss it in all-purpose flour. Then you’re going to sear the ribs on high heat until they are a dark brown with a good crust on all sides before they cook low and slow in the oven in your dutch oven. Most important tip I can give you about making short ribs: You are looking for the English cut of short ribs. They look like a cube, one bone per piece. Now here is where you get obnoxious. When you get to the grocer completely avoid the prepackaged stuff. You can absolutely request bone-in ribs if you’d like them, but I always request boneless short ribs, as you braise them the bone will always fall off the rib leaving fatty connective tissue behind. You can certainly make the flavors from scratch next time. I’ve made an Italian version with garlic, tomato sauce, dry red wine, fresh thyme, bay leaves and garlic cloves. Just season with salt and pepper to taste. Since we’re using a thick BBQ sauce as the base I’m adding some beef stock to the recipe to give it some additional liquids to cook low and slow until the beef short ribs are super tender. If heat is too high in your dutch oven (or the lid is not on firmly enough) you may need to add more liquids during the cooking time. 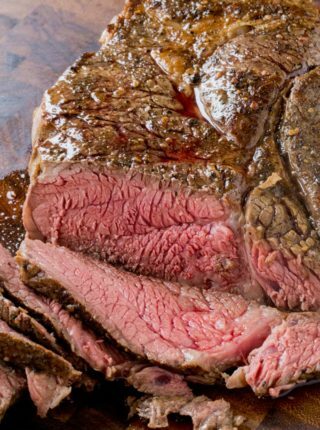 The first time you make this recipe, check on the beef a couple times while cooking to be sure you’re not running too hot. By using bbq sauce we avoid using red wine, tomato sauce or tomato paste and any other homemade sauce ingredients. So be sure you’re using a high quality bbq sauce, follow the old saying they use for wine, use one you’d drink. I cook these short ribs with my favorite bbq sauce ever. This sauce happens to be a copycat recipe from my favorite bbq restaurant I grew up eating at, Tony Romas. Back in the 1990s you’d have to wait hours to get into a Tony Romas and the wait was worth it! The ribs and the sauce and that ONION LOAF made it all worth while. I’ve been to a Tony Romas recently, the magic is gone, but I do have the loaf, the cole slaw and this bbq sauce recipe on my site to keep the magic alive. Make the sauce, you won’t regret it. I keep it in my deep freeze at all times, it tastes best warm. Add all the ingredients into a saucepan and whisk until combined. Bring to a boil, then simmer on low for 45 minutes. 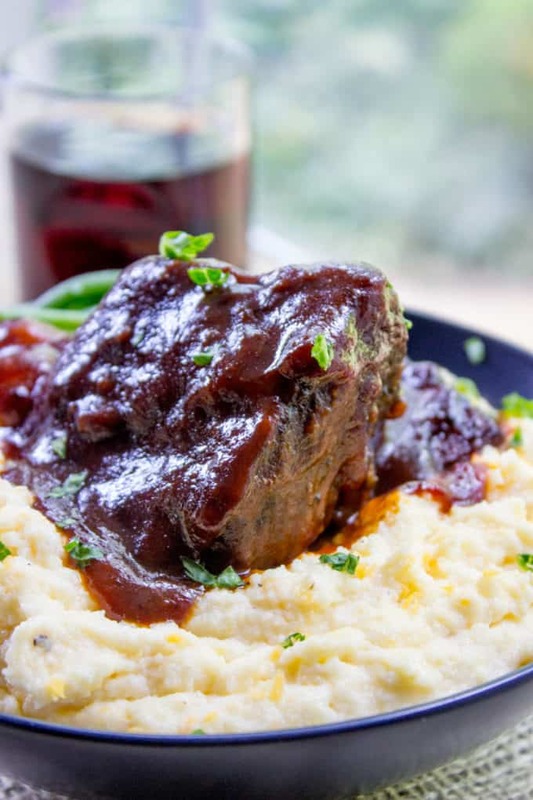 Short Ribs are best served with a glass of red wine, Mashed Potatoes, egg noodles, Creamy Polenta or French Fries and a salad like a Wedge Salad topped with Blue Cheese Dressing. The only other thing to truly ensure amazing short ribs, is salt, pepper and flour each piece. Then tap off the excess flour and brown it in your dutch oven on all sides. YES, all sides, including the bone (this helps add flavor, I promise). Then when it braises, it will become this beautiful, crust-covered tender piece of meat. 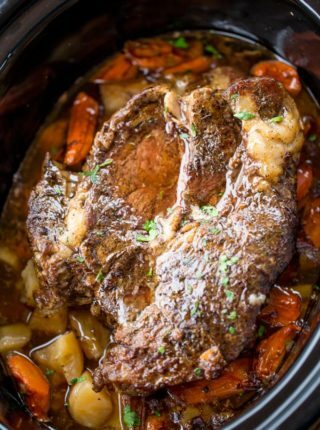 Brown the short ribs well on all sides in a dutch oven then add to your slow cooker and cook on low for 8 hours with the bbq sauce. Do not add any additional beef stock. Preheat the oven to 325 degrees, season your ribs with salt and pepper and toss with flour. In the dutch oven, add the oil high heat and brown the beef on all sides until dark brown, 4-5 minutes on each side. Lower the heat to medium, add the onions and caramelize them to a nice deep golden brown color, about 3 minutes, then add the bbq sauce, beef broth and short ribs back into the pot leaving them exposed by about a 1/2 inch. Put the covered dutch oven in your oven and cook for 2 to 2 1/2 hours, or until the meat it tender and can easily be pierced with a fork. The timing will depending on the size of each rib, if you have nice large cuts, stick closer to 2 1/2 hours. Hi just saved 3 of your recipes can not wait to try them, going to try the one pot taco pasta first looks so good. Then I want to try the shrimp taco, we buy them at Cilantro Taco so good, but if I can make them at home I can have them more often. Then I will try to make the beef short ribs, it has been a long time since I have made any because of the cost but I am sure going to find some on sale. Thank you so much for the recipes. I’m so excited for you to start trying them! I definitely search out sales too and stock up. Enjoy! When do you use the beef broth? Thanks for catching that! You’ll want to add it in with the BBQ sauce. I’ve edited it to read correctly. Very excited to find this recipe. Reading the instructions they do not mention the 1 cup of beef broth when to add. I would think to add it when you add the bbq sauce, but I could be wrong as I found some recipes do not work . Why do you say to have the ribs exposed by 1/2 inch as in all my years cooking this piece of meat usually they are covered in sauce . Since I want to make these for Passover is there anything I can use instead of corn syrup. The meat will break down as it’s cooking and release liquid so if you submerge them or add too much liquid, I find it creates more a mushy testure. Also, you can use a potato or tapioca starch as a substitute. Enjoy! Oh, gotcha! You can replace 1 cup of light corn syrup with 1 1/4 cups granulated sugar dissolved in 1/4 cup hot water. Use half that recipe as a substitute since you only nee 1/2 cup. How awesome, Peggie! So glad you loved it so much! Sooo good. It was worth the wait. I did buy beautiful meat to start with. I also love how simple this recipe is. 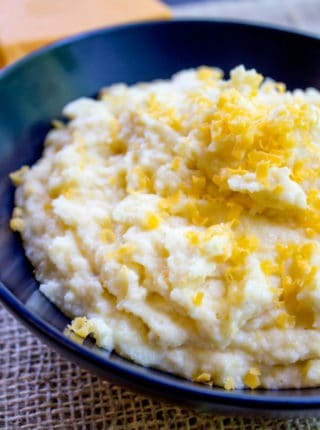 These look SO delicious, especially with the polenta! I actually really love using my dutch oven! You made this look so easy, I need to give it a try! When it comes to short ribs, being that obnoxious person at the meat counter definitely pays off. Waiting all day for ribs that are mostly bone is a huge disappointment. Good meat is definitely a big factor in how a dish can come out! This looks delicious! What a fantastic comfort food meal! I would love to make this for my family! Say hello to tomorrow nights dinner! Sabrina, these Ribs look great. definitely going try them this weekend. Thanks !! !